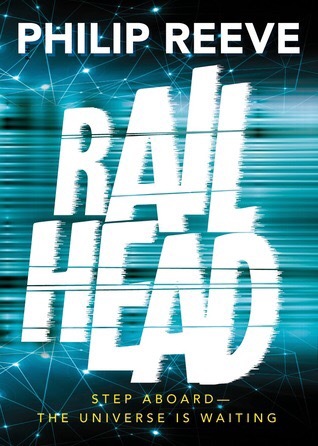 Railhead by Philip Reeve is the story of Zen Starling, thief and railhead – someone who loves the great locomotives that ride the rails between the worlds. It’s the far future, and humanity has spread out amongst the stars. Interstellar space travel is too difficult due to the vast distances involved, but for centuries there has been an alternative – the K-gates, wormholes that link the planets of humanity together. Huge trains ride the rails that run through the gates, so travelling the light years from one world to another is as easy as hopping on a train at one station and jumping off at another. Zen Starling uses these trains for his getaways after his petty thefts – but someone is chasing him, and before long he’s drawn into a plot that could have universe-shattering consequences. Railhead is a masterclass in universe building. There are echoes of the Imperium of Frank Herbert’s Dune, with family-run corporations ruling the empire, with power struggles and marriage alliances and succession politics rampant – the death of an Emperor is a time of uncertainty and a time for factions to fall in behind their chosen candidate. There are echoes of the Culture novels of Iain M. Banks – the trains have artificial intelligences, much like the Ships of the Culture, and have quirky names like Damask Rose, Thought Fox, and Time of Gifts. There are Hive Monks, too – swarms of insects that take on the rough shape of a human. And Station Angels, ghostlike apparitions that haunt stations after trains have come through the K-gates. There are vast powerful artificial intelligences – the Guardians – that can wear humanoid shapes as avatars. There are androids – known as Motoriks – that are uncannily human, and treated with somewhere between contempt and outright hatred – the people of Zen’s world had rioted against the Motoriks. You could check off the science fictional influences, but that would miss the point. There’s probably a TV Tropes page for each concept, and you could probably trace the central idea of a train between the stars all the way back to Night on the Galactic Railroad, but the important thing is they all work as a coherent whole. Never once does any of the elements jar. More importantly, none of the science fictional ideas ever gets in the way of the characters or the plot. This is the important thing about science fiction – no matter how cool your ideas are (and all the ideas that Reeve uses here are extremely cool) they count for exactly nothing if you’re not telling a great story. And Railhead has a great story. The pace is relentless, from chase to heist to disaster to rescue mission to all-out battle. There are enough twists and turns and revelations that I really don’t want to go into the details for fear of spoiling the fun. The characters, too, really make you care what happens to them. Just before a train went through a K-gate there was a moment of quiet, so short that only railheads caught it, as the wheels moved from the normal K-bahn track to the strange, ancient, frictionless rails which ran through the gate itself. That was what it felt like to Zen when he recognized the girl: a heartbeat’s silence, and then he was in a new world. The beauty of this passage is that it both tells us about how it feels to ride the trains of the K-bahn and lets us know exactly how Zen was feeling, without us knowing how either of them felt beforehand. This is where Reeve is using the science fiction not for its own sake, but to add richness and depth to his novel. Then I could go on about how nice it is to read about a far-future human society that isn’t just the Americans in Space that we’ve come to expect from Star Trek and Hollywood films, and the interesting nod towards gender fluidity (because really, why should an android have a fixed gender?) but I’d be writing about this book forever. Suffice to say, there’s a huge amount to enjoy in this book, both on and beneath the surface. I’d like to come back to this book in a couple of years. At the moment, I’m still buzzing from finishing it, but I have a feeling that this could be one of those books that stands the test of time and is destined to be a future classic. If nothing else, anyone who aspires to write science fiction should be required to read it. Because this is how you do it.